France's most violent urban riot in more than a decade engulfed some of central Paris on Saturday as "yellow jacket" activists torched cars, smashed windows, looted stores and tagged the Arc de Triomphe with multi-coloured graffiti. 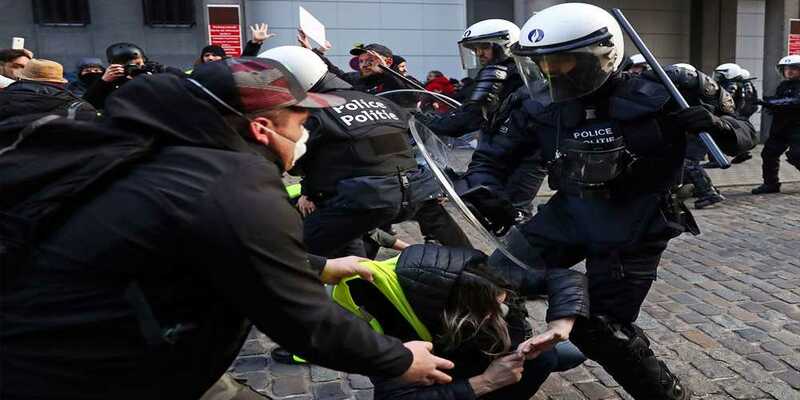 Protesters angry about rising taxes and the high cost of living clashed with French riot police, who closed off some of the city's most popular tourist areas and fired tear gas and water cannon as they tried to quell the mayhem in the streets. At least 113 people were injured. French President Emmanuel Macron denounced the violence from the G-20 summit in Argentina, saying those who attacked police and vandalized the Arc de Triomphe will be "held responsible for their acts." He said he will hold an emergency government meeting Sunday on the protests. "(Violence) has nothing to do with the peaceful expression of a legitimate anger" and "no cause justifies" attacks on police or pillaging stores and burning buildings, Macron said in Buenos Aires. He refused to answer any questions from journalists about the situation in Paris. It was the third straight weekend of clashes in Paris involving activists dressed in the fluorescent yellow vests of a new protest movement and the worst urban violence since at least 2005. The scene contrasted sharply with other protests in France, where demonstrations and road blockades elsewhere were largely peaceful Saturday. The violence is Macron's biggest challenge so far as president, and even coloured his international image as he had to defend his plans for fuel tax rises the initial impetus for the protest movement to other leaders at the G-20 summit. Paris police said at least 133 people, including 23 police officers, were injured in the violent protests and 412 others were arrested. They say 378 of the arrested have been put in police custody after the violence that tore apart parts of central Paris. Interior Minister Christophe Castaner, speaking on French television channel TF1, said one protester was in life-threatening condition after being part of a group pulling down a metal fence at the Tuileries gardens. A video on social media shows the heavy fence falling on some protesters. Since the yellow jacket movement kicked off on Nov 17, two people have been killed and hundreds injured in clashes or accidents stemming from the protests.